Where do I use my Simon Jersey voucher code? Founded back in 1971, Simon Jersey has been supplying an extensive collection of catalogue uniforms as well as designing bespoke items for global brands including the likes of Emirates, Nandos and many more. With this in mind, you know you are in the best hands when it comes to workwear. 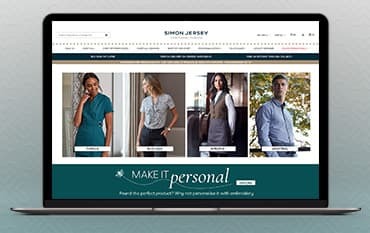 With over 45 years in the business, you can guarantee the highest quality and customer care at Simon Jersey where they are continuing to develop their workwear range week-by-week to bring their customers the most up to date trends, fabrics, colours and uniform solutions to businesses across the globe. Having recently launched 300 new product lines with much more to come! If you like Simon Jersey to supply your workforce uniforms, they offer a customer-focused range of services including a fast online ordering system where there is always someone on hand. Arrange a consultation with a uniform specialist today and don’t hesitate to check out our Simon Jersey Deal Page right here to secure yourself the latest discounts. Become a part of the Simon Jersey movement now! From receptionist smart-wear to medical scrubs and nurse tunic & medical dresses, the Simon Jersey Healthcare Uniforms are infection controlled and are designed to meet the key specifications required by nurses and carers working in a healthcare environment. Boasting all the key components essential including durability, flexibility and safety, Simon Jersey is leading supplies within the Healthcare profession so you know you’re in the best hands. Not only do Simon Jersey provide a superb selection of colours and styles, but you can also choose to have your tunics and carers uniforms embroidered to be consistent with your branding. Catering to both the public and private healthcare sectors, the Simon Jersey collection has been expertly designed with all medical requirements at the forefront of their minds! Shop the range today. Explore the Hospitality range at Simon Jersey today where you can find everything ranging from hotel, catering and restaurant uniforms as well as chef jackets and bar staff uniforms. Whatever your business is looking for, Simon Jersey has got you covered with their first class workwear options. Boasting expertly designed aprons, tops and trousers as well as customisable bar staff uniforms and front of house workwear - the Simon Jersey Personalisation Service can help turn your business into a recognisable brand. Open a trade account today to take advantage of the Simon Jersey Loyalty Scheme and start saving whilst you shop online today. If you wish to make a return, you must do so within 30 days of receiving your order. ITems must be in their unused and in their original packaging. Find returns labels within your parcel. You can return using Collect+ or the Royal Mail service. Get more Returns Information here. Simon Jersey is one of the UK’s leading workwear fashion retailers which proudly supply everything you need to wear at work! From small independent companies to multinational global brands wear, Simon Jersey can be found all over the world. Providing uniform and workwear for industries including beauty, healthcare and hospitality as well as work trousers, tunics, polo shirts and much more to suit an abundance of professions. What’s more, shop online using one of our Simon Jersey Voucher Codes to secure a discount at the checkout making it cheaper and more affordable to shop for your workwear!